So you’ve decided you want to shoot 3D? To do it right, you’ll need to know the workflows. First, a word about the haters. No matter what you say, some people aren’t going to like 3D. There have always been these people. A quick look at the history of movies shows what these naysayers are in for. Their complaints are often identical to the critics who disparaged adding synchronized sound and color. That said, there is such a thing as bad 3D. Things that cause headaches or just plain look stupid. What makes for good and bad 3D, and how can indie filmmakers use 3D and use it well? Read on. At the risk of sounding redundant, stereoscopic 3D adds another dimension to the traditional movie-going experience. That dimension is visual depth. Visual depth is perceived by the brain through a number of “cues”, only some of which are reproduced in stereoscopic motion picture technology. From what I gather, most “monocular cues” are already reproduced in your standard 2D image: motion parallax; perspective; occlusion; texture gradient, lighting and shading and defocus blur. Please note that at least one monocular cue, accommodation, the shift in the image caused by the muscles of the eye stretching the lens of the eyeball, would not be reproduced in either 2D or 3D motion picture images, since the focus is already ‘locked in’. With a second “eye,” the brain gets a much stronger picture of how far everything is apart in depth. Stereopsis is the name for the process that compares the angle of the two images to triangulate distance. Convergence is the name for the process that looks at where the two eyes agree in terms of focus (as I understand it). convergence – Where will things in the image converge? Will objects on screen appear in front of the picture plane, or behind? Things that “poke out” in front of the movie screen are said to have ‘negative convergence’, those behind ‘positive convergence’. Some other ideas… What about inverting the standard depth cues for a drug-sequence, making everything appear “inside out”? What about having hidden depth-popped elements — those that would blend into a texture in 2D but can be seen in 3D, like a “magic eye” drawing? What about having “depth dollies” where the separation expands even as everything else in the scene remains still? Of course, the use of depth, like any other tool in the filmmaker’s toolbox, should be used to support the story, not for it’s own sake alone. Hugo has smoke, dust particles or snow in almost every shot. Not only does this look fantastic in 3D, it helps sell the space and the atmosphere of the location. I did not see Titanic 3D but given director James Cameron and his team’s authority on 3D, that would probably be considered the reference for the state-of-the-art in post-conversion. As with all uses of stereo imagery, it can be done well or poorly. I saw the much-derided Clash of the Titans 3D, which was post-converted very hastily. It looked like there were people floating behind the characters. I hope to expand this section eventually, but for now my recommendation is to see Avatar and Hugo in 3D on a big screen if you can. These are the best uses of stereoscopic 3D I have personally seen and are widely regarded as “state of the art” by others in the field. Dreamworks Animation and PIXAR have also been doing a fantastic job in how they use 3D, and they put out movies pretty regularly. 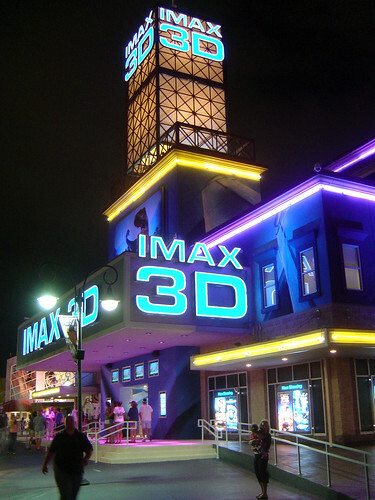 If faced with a choice of 3D projection processes in which to view major movies, choose RealD. I find it superior to IMAX3D, and the achromatic Dolby3D. More on the differences between projection tech below. Chompers 3D – Filmmaker Jesse Blanchard has been chronicling the production of Chompers 3D, a horror movie involving puppets, shot using Blanchard’s own d.i.y. 3D system. See my interview with him for more on his dual Canon-DSLR rig and homebrew playback system. More coverage on this site. When rigging two cameras together, you have to be careful to have identical lenses and settings, and also to trigger the recording at the same time. Misalignment due to motion is a big cause of headaches in viewers. Most pros use beam-splitter rigs with special mechanical focus, aperture and recording triggers. • Jesse Blanchard’s Robert Rig – I’ve seen the product in person and it’s great. Jesse is a filmmaker, and has refined the rig by using it himself. It has all kinds of filmmaker-friendly details and looks to fit most DSLRs and small-to-medium video cameras. YouTube promo. • Custom3Drigs.com – They offer rigs from $1500-$2500. • Allan Silliphant has a Vimeo test video with dual Canon 5DmkII’s and his profile says he offers custom rigs. I have heard that this a popular configuration. You would probably get this through a rental house, which also supplies a professional beam-splitter rig. I have heard that RED’s new Epic includes several design features to make it easier to use in a dual-camera system. Another configuration I have heard is popular among indie 3D shooters. Jesse Blanchard’s Robert Rig (see above) was designed around dual T2i’s. Hugo was shot with Arri Alexas on a beam-splitter rig. Most post workflows seem to involve using one eye to do a first pass on the edit, which is then compiled into 3D and viewed. Now there are editing systems that support instant playback of 3D footage. Starting with version 6, Avid MediaComposer supports full 3D workflows. A plug-in from Dashwood Cinema Solutions called Stereo3D Toolbox allows for editing stereoscopic files in Final Cut X.
I know that 3D titles and graphics can be done in AfterEffects, but I have yet to research it in more detail. There are Digital Cinema Package (DCP) standards for 3D movies. Anymore, the chances of having your 3D movie projected on actual film are slim. None, in fact, unless you’ve planned from the beginning to use some old system that is no longer supported by major cinema chains. Not all digital projectors support 3D, and there are some other theater features that are helpful, like a super-reflective screen to reflect back more light. Duplicate strobing of frames is also helpful in eliminating the tearing effect caused by lateral pans. I’m far from an expert in this arena, and have very little hands-on experience. I welcome notes and corrections from readers at makingthemovie AT-SIGN gmail DOT com, and hope to keep this page ever-evolving and updating. In my judgement, there are two components to using 3D in a cheap and effective way to enhance movie storytelling: the art and the equipment. As usual, they go hand-in-hand. But the bottom line will always be whether they support the story. Rickey’s Self Abuse by Flickr user Lomo-Cam used under Creative Commons Attribution 2.0. a href=”http://www.flickr.com/photos/laffy4k/526431615/”>IMAX 3D by Flickr user laffy4k used under Creative Commons Attribution 2.0.